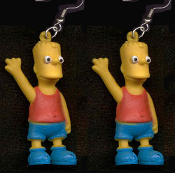 The Simpsons - BART EARRINGS - BIG Mini Figure Funny Dysfunctional TV Cartoon Family Character Theme Costume Jewelry - Each Matt Groening inspired miniature funky novelty toy charm approx. 2-inch (5cm) tall. I'm Bart Simpson from Springfield. Who the Hell are You?